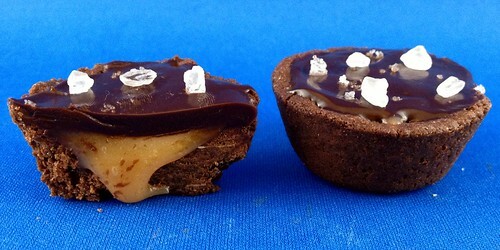 And…my obsession with chocolate and salted caramel continues. When David Lebovitz posted this recipe, my aunt immediately asked me if I had been to the bakery (Little Flower Cafe) he referenced in his post. Sadly, I have not, but it is now on my list of places to try. Since David shared a recipe adapted from one of the Little Flower Cafe recipes, I figured making the recipe could tide me over until I find a friend willing to schlep to Pasadena with me. While these tartlets are a bit time consuming, they are not only delicious but absolutely gorgeous. My coworkers were oohing and aahing over them at the office, and their small size makes it perfectly acceptable to have one or two. Or three. Or um, maybe four. They’re a great party dessert too, because they’re easy to hold and won’t last for more than a few bites. In fact, I may bring these to my friends’ annual New Years Eve party. To make the tartlet dough, beat the butter and the sugar just until smooth in the stand mixer with the paddle attachment, or by hand. Add the egg, salt, and vanilla, and beat until smooth. In a separate bowl, whisk together the all-purpose flour, rice flour, and cocoa powder, then mix it into the creamed butter. Butter the indentations of two mini-muffin tins with 12 places in each, or one mini-muffin tin with 24 places. Pinch off pieces of dough and roll each into a 3/4-inch (2cm) ball. As you work, put the dough balls in the indentations of the muffin tins. Take your thumb and press the dough down in the center of each indentation, then use your thumb to press the dough up the sides. (If the dough is sticky, dampen your thumb very lightly with water or oil.) Freeze the pans of dough for 20 minutes. Bake the tartlet shells for 8 to 10 minutes, until the dough appear dry and cooked. Remove from oven and use the handle of a wooden spoon to widen and smooth the inside of the little tartlet shells, pressing the dough that’s puffed up somewhat firmly against the sides. Let cool completely, then remove the tartlet shells from the muffin tins – the tip of a paring knife might be needed to help aid them out – and set them on a wire cooling rack. Make the caramel filling by warming the cream with the caramels in a small saucepan over low heat, stirring, until the caramels are melted and the mixture is smooth. 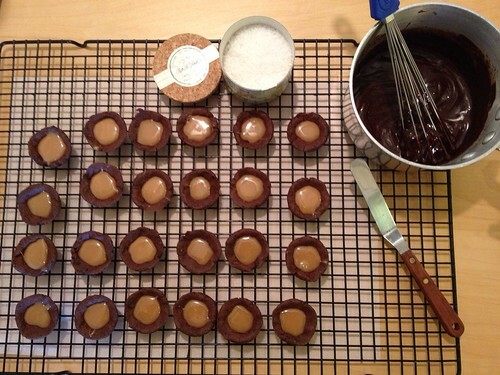 Divide the caramel into each of the tartlet shells. Make the chocolate ganache by heating the cream in a small saucepan. Remove from heat and add the chopped chocolate. Let it sit for a minute, then whisk the chocolate into the cream until the mixture is smooth. Top each tartlet with some of the ganache and take a butter knife or small metal spatula and swipe off the excess. Sprinkle each tartlet with a few grains of sea salt.